Roasting is one of my favorite ways to prepare vegetables. The hot oven evaporates moisture, making the vegetables tender and caramelizing their natural sugars. Roasted veggies are great on their own, and they’re a natural alongside a dish like chicken or pork roast. Here at Kitchen Riffs, we’re no stranger to their deliciousness. In recent months we’ve made Roast Sweet Potatoes, Roast Cauliflower, Roast Belgian Endive, Roast Asparagus, and Roast Eggplant. Heck, we’ve even done a Roast Strawberry Salad. But nothing is better than Roast Potatoes. And with the cooler weather we’ve been having, we’re now enjoying the kind of hearty meals at which roast potatoes are particularly welcome. So it’s time to discuss how easy, fast, and off-the-charts-flavorful this dish can be. Roasting potatoes (and most other vegetables) is simple: Just toss cut-up veggies with olive oil, salt, and pepper before popping them into the oven. You can add herbs or garlic if you want to kick up their flavor. Or if you’re preparing roast meat, just add the potatoes to the roasting pan for the last 30 or 40 minutes, and let them baste in the juices. You can roast potatoes (or any vegetable, for that matter) at oven temperatures ranging from 300 to 500 degrees F. I prefer 400 - 425 for potatoes. They take longer to cook at lower temperatures, and at higher temperatures they have a tendency to char somewhat (which I sometimes regard as a good thing, although it’s not always something I want). You can use any type of potatoes for roasting — including the baking varieties (russet) or the waxy boiling types (red skinned, Yukon golds). And you can peel or not as you choose. I usually leave the skin on baking potatoes, but peel the waxy ones. You can also cut the potatoes into almost any shape you like — from a large steakhouse “fry” shape to big chunks. I usually figure one baking potato or 2 small-to-medium boiling potatoes per serving. But people usually want seconds on this dish, so adjust accordingly. If you’re going by weight, figure a good half pound per person (to make sure you have enough for multiple helpings). The recipe below serves 4 — barely. Depending on how hot your oven is and how large you cut the potato pieces, roasting can take from 30 to 50 minutes. Don’t count on having leftovers. But if you do, they’ll store well in a covered container in the refrigerator for a few days. Preheat oven to 425 degrees F (or any temperature from 300 to 500; but roasting time will vary; see Notes). Scrub potatoes and peel if desired. Cut into your preferred size and shape. I usually cut the potatoes into quarters or eighths (depending on size). But you can cut them into ½-inch rounds or dice, split the potatoes lengthwise and cut into half-moons, cut them into wedges, or even cut them into the shape of French fries. See Notes. Put potato pieces in a large bowl with olive oil and salt, pepper, and optional herb to taste. Toss until the potato pieces are coated. Spread the potato pieces on a large rimmed baking sheet or in a casserole baking dish. You want the pieces to be in one layer, and not touching (to promote even cooking). Use a baking sheet/dish that’s just large enough to hold the potatoes in one layer. Roast the potatoes for 15 minutes, then stir or toss to turn over. Continue roasting until they are tender throughout, but not mushy. At 400 degrees, this usually takes 30 to 44 minutes for potato chunks (depending on size), so I start checking at 30 minutes. Stir pieces once or twice during roasting to promote even cooking. If you want a bit more char on your potatoes (at this temperature you won’t get much), run the baking pan under the broiler for a few minutes until you achieve the result you desire. I use “pure” olive oil (the cheap stuff) because the aroma of extra virgin dissipates during the long roasting time — so IMO you’re wasting money if you use this. You can use more or less olive oil than called for in Step 3, depending on what flavor you want. If you want a really low-fat dish, you can get by without using any olive oil, although the potatoes will be somewhat dry, and also less flavorful. If you go the “no olive oil” route, spray the cooking sheet/dish with baking spray to reduce sticking. If you’re roasting meat, this dish (or any roast vegetable) is an ideal accompaniment, because it will cook at any temperature you’re likely to use for cooking the meat. As noted above, if you add the potatoes for the last 35 minutes or so of the meat’s cooking time, they’ll baste in the rendering fat and taste delicious. But oven temperature affects how quickly potatoes roast. At 500 degrees, it could take as little as 30 minutes. At 300 degrees, they may need close to an hour. So start testing at the 30-minute mark (or maybe the 25-minute mark if you’re roasting at 500 degrees), and keep testing every 5 to 10 minutes until you determine they’re done. The other main factor that will affect roasting time is the size of your potato pieces. Smaller ones will roast faster, large ones slower. If you cut potatoes into ½ inch dice, they may cook in as little as 20 to 25 minutes. Spreading out the potato pieces so they don’t touch promotes even and rapid roasting. If you pile them into a casserole, they will still be good. But they definitely won’t char (which you might not want anyway) and their surface texture won’t be quite as crisp. Garlic goes well with roast potatoes. If you’d like to add it, peel and mince 2 or 3 cloves of garlic, and toss with the oil in Step 3. Likewise herbs (I like dried thyme) or spices (I favor cayenne pepper, ground cumin, and/or ground coriander). Use about 1 teaspoon (half that much if you want only a hint of flavor) and toss with the oil in Step 3. Or try any herb or spice that you’re fond of. If it sounds good to you, it probably will be. Potatoes are a favorite for most of us, but roasting them isn’t as popular in the US as in some other parts of the world (they’re indispensable in Great Britain as part of many people’s traditional Sunday Roast Dinner). Mrs. Kitchen Riffs and I were having a nice dinner of roast potatoes and chicken. But the bird must have been feeling neglected as we piled second helpings of potatoes onto our plates. Better than French fries? Yeah, I think so too. But give them a try and decide for yourself! You know how I feel about roasting vegetables as well - it's the absolute best! You managed to get such a beautiful, crisp crust on your potatoes and managed to make a humble dish look gorgeous. Hi Spicie Foodie, aren't roast potatoes wonderful? Really addictive, unfortunately. ;-) Thanks for your comment. Hi Marta, one potato isn't possible - at least not for me! ;-) These are really look, and I'm sure your friends would enjoy them! Thanks for the comment. Hi Katherine, yup, roasting is maybe the best way to prepare an awful lot of veggies. Thanks for the kind words, and the comment. Your potatoes look wonderful. I'm with you on roasting. We love it and it couldn't be easier. Tonight I'm grilling steaks and my family wants roasted Campari tomatoes and roasted butternut squash. I make those often in liu of potatoes. I could dig a fork into yours right now and eat them straight from the bowl. Hi Sarah, aren't they so good? I really could have these, and nothing else, for dinner! Thanks for the comment. Hi Uru, they were really good! Not chocolate, of course, but the next best thing! ;-) Thanks for your comment. Hi Vicki, roasting is such a great way to prepare veggies - totally love doing it. The tomato and squash sound terrific! Thanks for your comment. Dude you had me at potato. I am a spud girl, love them far too much. Roasted potatoes (and carrots) are my weakness. These are cooked to perfection. Loving that first photo. Just got caught banging my fork against the screen. SO embarrassing! Hi Lizzy, aren't they great? And so easy to make! Thanks for your comment. Hi Kim, sorry you bent your fork. ;-) Roast carrots are also excellent - another fav of mine. Thanks for your comment. Hi Alyssa, I almost always leave the skins on when roasting baking potatoes - you're so right about how crispy their skins become. Thanks for your comment. Pretty much the only way I make potatoes; in the summer they get a bit more savory with garden herbs but I'm good with just olive oil and salt and pepper too! Amazing how sometimes the EASIEST thing ever is so good; these are proof aren't they? I do agree with you on roasted potatoes, they are the best. Hi Barbara, I agree that easy is often the best! Great thing about these is there are so many different ways to flavor them, although I'm with you that olive oil with salt and pepper are pretty near perfect. Thanks for your comment. Hi Dawn, definitely the best! ;-) Such good stuff. Thanks for your comment. There's nothing like a crispy roast potato. Leftovers? Never! I love adding different herbs and spices each time depending on how the wind catches me. You are SO right! There really is nothing better than roast potatoes. I was actually thinking this morning "Wow. It has been such a long time since I have made roast potatoes" and then these!! You have clearly read my mind, I love it! roast potatoes are my favourite version of this versatile food!!! with rosmary thime and butter!! love it! One of the benefits of Fall's return is to be able to start roasting potatoes again. Our past Summer was so hot I was loathe to bake or roast anything. This is a great how-to post, John, and one that is sure to get referenced repeatedly. Thanks for sharing. Definitely better than fries. I love roast potatoes topped with a dollop of sour cream and some parsley, YUM. I love roasting vegetables too! I also think roast potatoes are far better than fries, any day! Roasting might be the best way to cook everything ;) I just did green beans like this for the first time last night and they were to die for. Your potatoes look just as good! Hi Suzanne, I agree the idea of leftovers is pretty much a fantasy. ;-) Love your phrase, "depending on how the wind catches me." Such a nice description! Thanks for your comment. Hi Carolyn, I certainly can't blame you! I really have been known to feast on potatoes and ignore much of the rest of dinner. Thanks for the comment. Hi Cathleen, hope I've nudged you over the line to having some soon! Thanks for your comment. Hi Nami, whenever I make mine with less oil I always go for the char. And usually, although not always, do the same when I use more oil. ;-) Cold weather always = comfort food in my book, too. Thanks for the comment. Hi Raymund, they were really good! Wish I had some now . . . ;-) thanks for your comment. Hi Valentina, butter is a superb addition to roast potatoes. Of course butter is a superb addition to anything! Thanks for your comment. Hi John, I agree this past summer was too hot for this type of food - I don't remember roasting anything! Of course some things you can grill on the barbecue, but roast potatoes demand an oven IMO. Thanks for the comment. 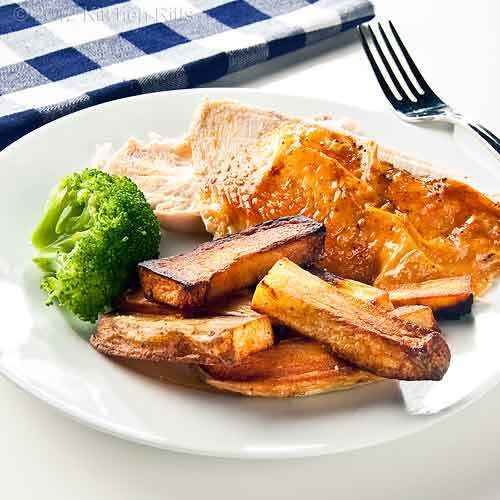 Hi Lizzie, it's close, but I think roast potatoes edge out fries too! Sour cream and potatoes is such a nice combo, isn't it? So yummy. Thanks for your comment. Hi Ali, always happy to have reinforcement in my feeling that roast potatoes are better than fries! Good, aren't they? Thanks for the comment. Hi Charlie, I don't know anyone who will turn down a roast potato (unless they don't like or can't eat potatoes). Such good stuff! Thanks for your comment. Hi Julie, you could be right that roasting is the best cooking method! Certainly it's easy. Green beans are one of those things that I don't roast - I definitely need to, don't I? Thanks for the comment. Hi Bam, I still kinda think they're one of the main food groups, alas - I eat far too many! Hard to resist. Most of the potatoes in the pictures were Yukon golds (one had baking potatoes), so they're naturally just a bit yellow (when cooked) to begin with. Thanks for your comment. Hi Judy, good side dishes really make a meal, IMO. Most people will enjoy the main course, but it's usually the side dishes - if they're done well - that they remember. Thanks for the comment. Looks like you've been busy in the kitchen the past few weeks making all my favorite fall foods. Your photos make the food jump off the page, everything looks delicious! Now that at Home with Rebecka has moved to wp my stats have gone way down. It means the world to me that you take the time to visit my blog and leave such kind comments! It will take some time to get back to where I was on blogger. Thank you! Wow, I think I could make a meal of these, such simple ingredients, such spectacular results! John, one of these days you're going to be sitting there having your normal chat with Mrs. KR and find a completely unwanted presence lurking in the corner...i.e. you will find me sitting there recording every word that is exchanged between the two of you. I love how your scenes play out, and I really can't wait to go do some roasting of my own! Sweet potatoes sound like a good roasting option right about now...and maybe some roasted apples and pecans, what do you think? I could easily make a meal out of roasted potatoes. I'm so happy we have finally cooled down enough to enjoy leaving the oven on, I'm going to the farmstand later to scope out so veggies for roasting. Hope you have a wonderful week. Hi Rebecka, aren't roast potatoes wonderful? I like all roast veggies, but these are one of my favs. Hope all your traffic finds you again after the move! Thanks for the comment. Hi Café Sucré Farine, simple is often the best, don't you think? And these could easily be a meal! Thanks for your comment. Hi wallflourgirl, you'd be quite welcome! Sweet potatoes are wonderful when roasted - and maybe sure you add a touch of cayenne pepper for some heat. Apples & pecans sounds delish, too. Thanks for the comment. Hi Gina, I agree roasting things is better in cool weather. Have a great trip to the farmstand! Thanks for your comment. Nothing better than roasted veggies, regardless of what it is - white, sweet potatoes, broccoli, cauliflower, green beans, tomatoes, the list goes on and on. I disagree with Mrs. KR; well done roasted potatoes, IMHO, rival French fries ;-). OOOH yummy, roasted potatoes are my favorite. These look wonderful! Lol, you weren't kidding when you said you love roasting veggies! These looks awesome - I love the golden color and I'll admit that I'm a big char fan. I agree with Mrs KR - roasted potatoes are better than fries! Your potatoes are roasted just the way I like them - a little charred on the edges. They look perfect and SO good! I've never gone the no olive oil route with roasted vegetables. It just never occurred to me, but then why? :) I think I need to add potatoes to my grocery list because now I'm craving a plate of them! Hi Denise, I like virtually any veggie roasted, particularly during cooler weather. The roasted potato vs. French fry question certainly is worth debating! Thanks for your comment. Hi Kristi, aren't they good? And they were wonderful. I need to make some more! Thanks for your comment. Hi Food Jaunts, they were so good! And char on roast veggies just seems so right to me. Thanks for the comment. Hi MJ, I think the potatoes taste better with olive oil, but still pretty good going without. It's definitely worth a try, and certainly healthier. I probably do them that way about 1 time in every 5. Thanks for the comment. You are absolutely right. Roasting vegetables the best way to cook them especially potatoes. I like just putting olive oil, salt, pepper, and garlic powder. I like how your potatoes are perfectly caramelized. Looks delicious, John. Have a good week! Hi Ray, I think most people really like roast veggies. Obviously we both do! Garlic powder is a great idea. Thanks for commenting. Roasted potatoes are simply the best thing ever, I can happily eat that as a main course! I often eat too much potatoes that I can't finish my main dish anyway. 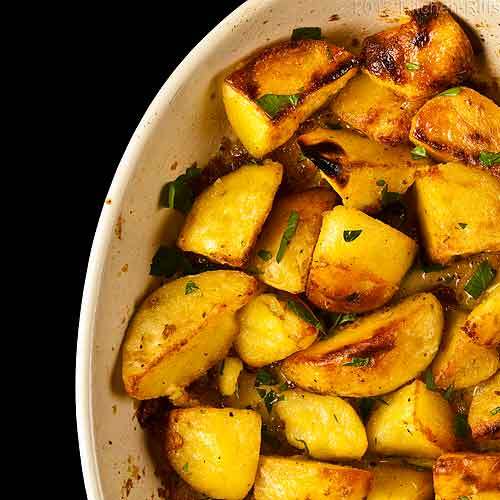 :P love this recipe, your potatoes look so golden and delicious! Hi Jenny, whenever I serve roast potatoes they're my downfall too - I eat way too many of them. I do manage to eat other things, too, but I don't do them justice. Thanks for the kind words, and the comment. I like anything with potatoes. They are the simplest and affordable ingredient to work with. Infact they are so versatile and porous that soaks up any spice we add to it. 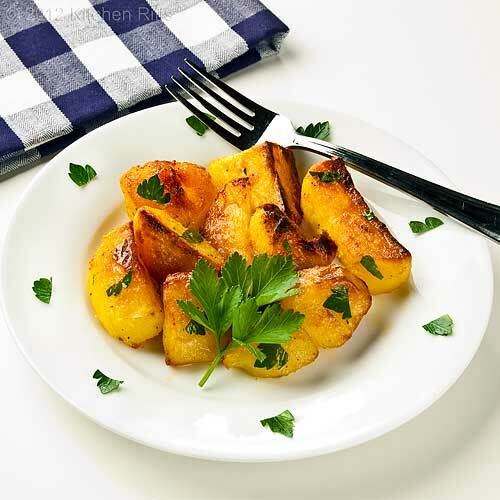 I love roasted potatoes with freshly made cumin powder, salt and pepper, tossed with ghee (Indian clarified butter).I am so glad that I found your blog. I will be back often to check your recipes. Let's stay connected. Hi Vijitha, welcome! And I'll definitely check out your blog. 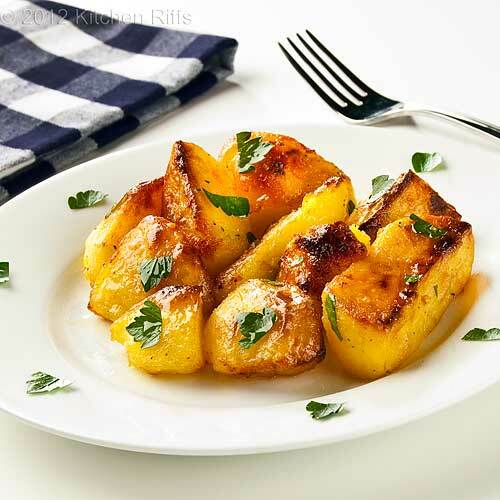 I agree that cumin is sensational with roast potatoes - an excellent way to enjoy them. Thanks for your comment. Thanks for sharing this John! They are always better than the fries! I love the roasted potatoes and they go well with anything. It is the perfect time now to roast vegetables, you are right, even if the temperatures are still hovering around 80s here in the SC!!! Hi Helene, I didn't know that this dish was so common in Austria - thanks for the info! I kinda wonder what we all ate before potatoes became so popular! Thanks for the ocmment. Hi Ilke, aren't roasted potatoes so good? And even if the temperature is a bit higher than ideal for oven roasted things, when it's fall that means it's time to roast! ;-) (We're getting into the 80s today here in St. Louis, too.) Thanks for your comment. My hubby and I are dieting before the holidays and the one things I'm missing is roasted potatoes! Your pictures are making my mouth water! Hi MotherRimmy, sorry about that mouth watering thing. ;-) These definitely do have a few calories (although if you do them with no - or minimal - olive oil the calorie count isn't too bad). Thanks for your comment. Hi Christine, aren't roast potatoes such good stuff? Duck fat with these would be terrific! I definitely need to try that. Thanks for your comment. Okay so I totally tried your method of roasting these tonight. Perfection. I added herbes de provence. Very yummy!I love playing around with potato recipes. There's so much you can do to a spud. Hi Kim, herbes de provence is a great flavoring for these. Glad you enjoyed your spuds! I love, love, love roasted potatoes........these ones look fantastic.....yum! Hi Culinary Collage, roast potatoes are so good, aren't they? Just love them. Thanks for the comment.